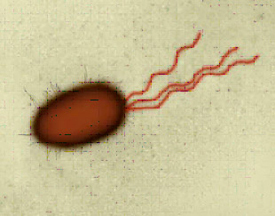 Tiny microrobots are under development at Monash University in Australia; a remarkable micromotor will allow them to swim using a flagellar propeller, just like the E. coli bacterium shown below. Dr. James Friend's goal is to build a device no wider than 250 microns - that's the width of two human hairs - that would be capable of swimming through the human body. 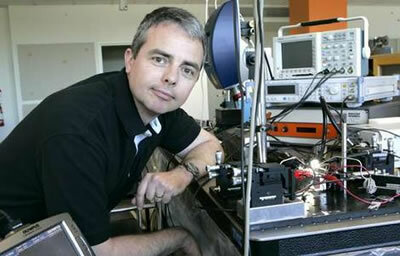 He and his team have already built a linear motor the size of a salt crystal. With a $300,000 grant from the Australian Research Council, Dr. Friend believes that his team will be able to reduce the motor to the necessary size within three years. "The swimming robot idea in and of itself has indeed been around a long time---since at least the 1950's anyway, and our motor is of a scale and has the performance characteristics needed to actually make this sort of thing possible. Regarding performance, as electromagnetic (EM) motors are reduced in size, they tend to have far higher rotation speeds: a typical 3 mm diameter EM motor will spin at over 20,000 rpm. Worse, the torque of such motors could be measured in micronewton-mm, only useful if one also employs a gearbox. We're using ultrasonic motor technology here, which offer higher torques at lower speeds. Traditionally that has always been the limitation of any of this technology: the motor. If you pick up a typical electronic parts catalogue, you'll find all sorts of sensors and electrical components, but very few of them actually produce physical motion. Those that do are certainly not solid state, and this is a need we're hoping to address." A design for the prototype microrobot is shown below; Dr. Friend states "We've operating larger mm-sized prototypes of the motor, and have a fairly good handle on the analysis, which turns out to be quite complicated for twisted-beam structures." The micromotor that Dr. Friend and his team have designed for their propulsion system should be smaller overall than a similar microrobot propulsion system described earlier this month by Dr. Moshe Shoham (see Propulsion System for 'Fantastic Voyage' Robot). Dr. Friend points out that his team has a "motor suitable for his [Shoham's] or our propulsion system that is far smaller than the technology he's [Shoham's] wanting to use." Ultimately, tiny microrobots would give surgeons the ability to avoid traumatic and risky procedures in some cases. A remotely-controlled microrobot would extend a physician's ability to diagnose and treat patients in a minimally invasive way. Other sources for this story include this article and this Monash University press release.